On a beautiful sunny Sunday morning, Bledlow Ridge Girls U11 played the first ever girls’ team match for the club at home to Farnham Common Boys U9. It was perfect weather for cricket and there was a very good turn out from parents and club members to help support the girls. The game was played to Barrington rules with Katie Pargetter (KP) winning the toss as captain and electing to bowl first. A fine bowling innings was unfortunately not reflected in the score, however Grace Hunt, Marissa Searl and Tilly Fellows were notable in their excellent bowling actions with Grace taking the first ever wicket for the Ridge Girls with a very fine ball. Grace Hunt played a very fine game as wicket keeper sharing the role with KP, and catches were taken by both Tilly and Freya Youens. 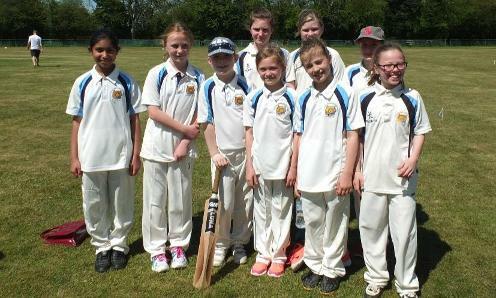 Grace managed a very good stumping at the end of the game and fine performances in the field by Anah Rahman, Anouska Modray-Lane, Freya Youens, Bessie Chalmers and Chloe Bird means that the Ridge Girls showed a very good start to their season. Our batting innings was fairly solid, but we definitely have some things to work on for the next match; the highlight was definitely KP’s six. Everyone enjoyed themselves and all the girls look forward to their next match away against Great Kingshill on the 18th. I couldn’t be prouder of them all.